Oh my – what a wonderful city Munich is – even if it is raining. And one of the first things I saw after climbing 4 flights of stairs to my brother and sister-in-law’s apartment in the Haidhousen area of Munich, was a wooden “whisper” room. 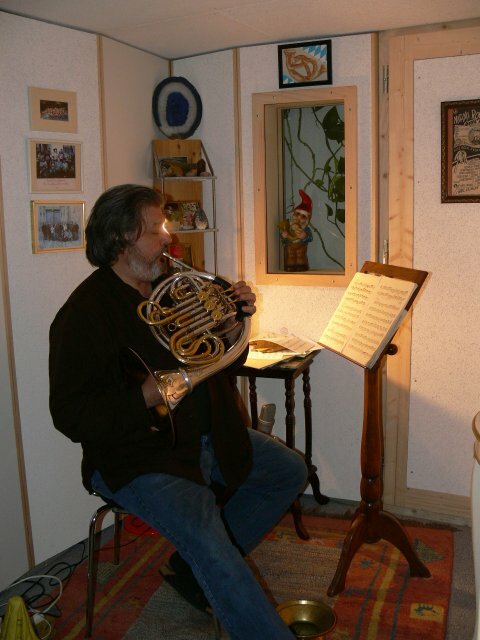 My brother is a horn player – a world-class horn player. He is presently principal horn for the Bavarian Radio Orchestra and for 30 some years was principal horn for the Munich Philharmonic. 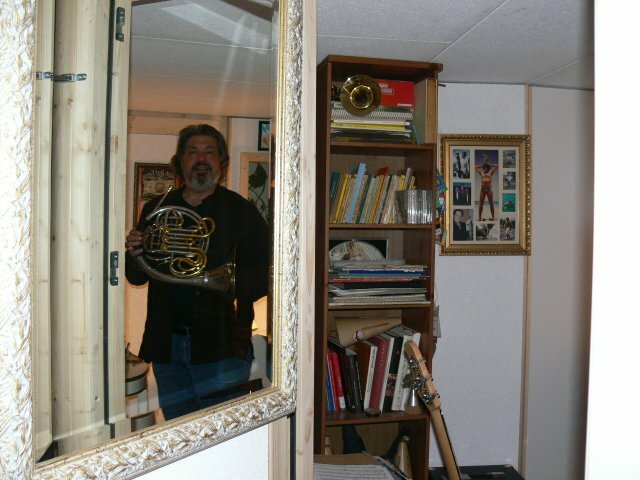 After finding this new apartment right in the middle of a park near the Iser River, he had to convince the landlord that his 3 times a day practicing wouldn’t be obstrusive. Somehow he was able to get the potential landlord to visit someone who had a “whisper” room in their apartment so that he could hear that there was really no sound emerging. So there it was – a 13,000 Euro wooden room with snap together sides that block 95% of the sounds he makes when practicing. And even after nearly 40 years of playing the horn, scales 3 X a day are not the most pleasant sound for the average neighbor. I was instantly jealous – because I could hear the low low low noise floor and knew that I would be very happy in that room. 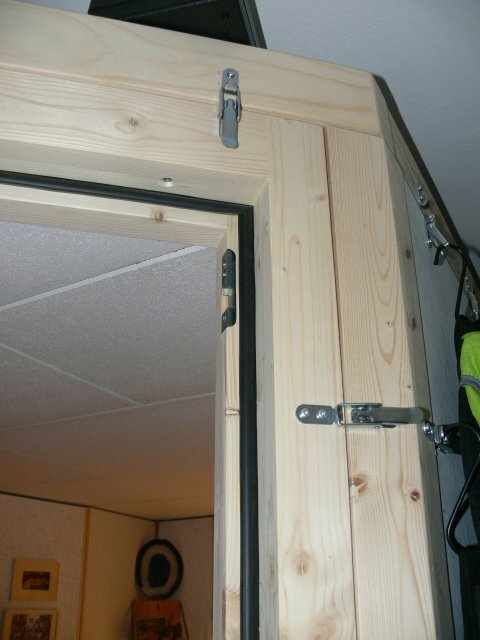 He has it hung with mirrors and pictures and a ventilation system – which is great for him, because he is trying to keep his noise out, not outside noise from coming in. The current trend for demos (and this is not an exact science) is at least three – 1 minute excerpts with a slate before each. Pick from familiar books – good books, but not best sellers done by well known audiobook narrators. Although it was suggested that you could send a specific producer a snippet from something they have produced. This would require several demos customized to each producer, of course. Your demo should also have pristine sound – rent a studio if necessary – and use a director. Got your demo(s) done – look for a publisher who will take a chance on you – probably not the big houses, but the smaller publishers. Then “throw down the “f” word” before the key words in the copy. Don’t worry, you’ll find them. Now take out the “f” word and underline the vowels in the word that followed the “f” word. Try it – it seems to work. Doug Turkel came next – he is the UNnouncer. His message was multi-fold (much like his little handouts). First, we need to identify why clients are looking for us – wait, that sounds a bit like some of what Peter said (hmmm). And who do we want to find us (ah, a theme is developing here). We also need to make it EASY for them to find us! He encourages targeting our specific markets by using some of the free tools available – for example, sign up for free trade magazines in industries where you excel – and scour the business journal and business sections of your local paper. Trish Basanyi (as usual a vision in purple) focused her remarks on social media and how it can be leveraged to get work. Use the import contact features and start connecting with your existing contacts in a more personal way. David Kaplan calls himself the Voice On The Run and never stops – not even for dinner. While most of us probably couldn’t keep up his pace, he suggested finding the people who want to buy what we have to sell by using such tools as BackStage’s Call Sheet (formerly the Ross Report) to glean contacts. They usually do reports twice a year for voiceover people. Comedy – it’s all in the timing – well, timing and a few other things. Pat Fraley was the opening act – presentation – of VOICE 2010 and set the standard. He outlined “Eight Common Elements to Comedy” and then set out to challenge a few folks from the audience to be funny. But first he called on a volunteer – specifically a male – tall – uh, say 6’7″ – oh and Jewish – and suprised the group with Brad Garrett who had positioned himself in the back of the room. Here is the list of those 8 common elements of comedy from Pat’s presentation. It has been quite a day here in Los Angeles – well, Century City to be exact. A quick brisk walk around the hotel’s perimeter early during the June gloom and then indoors for the rest of the day – and a mixture of glad-handing, comedy, affirmations, introductions, re-introductions and much more. It’s about 10 PM now and I am back in my room trying to catch up on the sleep I missed last night. Hard to do when there are people to talk to at every turn. The conference has been great so far. Pat Fraley brought his friend Brad Garrett to be part of his opening presentation on Comedy. Wonderful stuff – which I unfortunately – or perhaps fortunately – had to duck out of for a while to respond to a client who needed something recorded this morning. I was able to snag a spot at 11 AM in the Dave & Dave Whisper Room to do a phone patch session with this political client and managed to get back to the rest of Pat and Brad’s – uh – act (spontaneous impromtu fun) before heading into the booth to convince people to vote for the proposition. Later in the day, I had a chance to meet a regular client face-to-face who was presenting on what makes a go-to talent. There were three of us in the room who were on his roster of “go-to” talent and he didn’t know we were there until we flashed our badges. Very cool. What a treat to finally meet him. An hour or so at a hospitality suite and then a wonderful conversation down by the lobby bar and I am back in my room trying to get to sleep a little early. Wait – did I forget to have dinner? Most of you know what happens the last few hours before you are heading out of town for a long trip. The email comes flooding in with re-dos, new work, emergencies, and other assorted things that need to be handled before you can finish packing. I’m headed to LA for VOICE 2010 around 2PM today and of course that’s the way my morning started! Biotech client finally sent the changes to a project we did 3 weeks ago. Luckily we can schedule that session for next week. Government agency client wondering if the end client had ever gotten back to me with a pronunciation question – and needed the new files before the end of the week. No, they hadn’t gotten back to me, but we searched YouTube to hear the word said by native speakers and made that fix. Same client found one error in the last set of files I sent that needed to be fixed. ISDN session with audio studio in Washington DC doing 2 national radio spots. Four short lines of dialogue with my imaginary daughter. Well, she was real enough, but not on the call. BlackBerry needed to be synced and the software froze – so time for update – THEN sync. The fires are calm for the time being. Check back tomorrow!